The USDA’s “MyPlate” graphic is seriously flawed. There’s no doubt in the Paleo world about that, and no need to repeat the reasons why eating grains is a bad idea, or why that glass of milk off to the side might not be for everyone. Just looking at the 5 food groups on the plate (fruits, vegetables, grains, protein foods, and dairy) makes it obvious that the “balanced diet” is anything but: it’s completely missing a crucial macronutrient! But what’s more interesting about these guidelines isn’t the misguided recommendations of any one particular food or food group; it’s the overall concept of a “balanced diet” as the final word on healthy eating. The New York Times defines eating a “balanced diet” as “getting the right types and amounts of foods and drinks to supply nutrition and energy for maintaining body cells, tissues, and organs, and for supporting normal growth and development.” So far so good; there’s not much anyone could object to in that. But that definition is vague enough to be applied to almost anything. Paleo could claim that description just as well as the USDA. So could the vegan movement, the macrobiotic movement, or any other dietary group. Obviously, if the term “balanced diet” is going to have any meaning, it needs to be more precise. 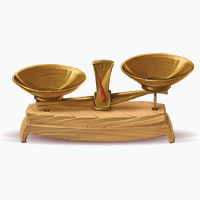 Related to this, “balance” also seems to involve “balancing” calories with physical activity. MyPlate promotes the idea that calories, not specific foods, are the fundamental cause of obesity. For weight loss, the official recommendation is to restrict calories (but without eliminating any one food group), and “balance” those calories with more exercise. These claims have some truth to them. A certain amount of variety in the diet is definitely beneficial, and calories are important for weight loss (although they don’t tell the whole story). Nobody is arguing that you should eat a diet entirely of meat, or that you’ll lose weight on 4,000 calories a day as long as it’s all from coconut oil. But this narrative about the “balanced diet” has a lot of significant downsides as well, without even going into the specific foods involved. Where Does the “Balanced Diet” Come From? To understand what’s wrong with the “balanced diet” idea, first we have to understand where it comes from. Specifically, the dietary guidelines aren’t based on studies, clinical trials, or even doctors’ practical experience. The science behind them is often incomplete, inaccurately represented, or simply ignored when it suggests something inconvenient. Three out of the top five lobbyists were from the sugar industry. The other two were massive conglomerations of other agricultural products, including meat and grains. The dairy industry is also well known for the depth of its pockets: in 2010, the combined lobbying efforts of all the dairy industry groups totaled $5,655,885. The biggest player in this group, Dean Foods (which sells Horizon organic milk, Land O’Lakes, and Borden products, among other brands), spent $1,151,000. These companies have huge vested interests in getting their particular food groups favorably represented on the official guidelines, and making sure people don’t cut out any one food group. Unsurprisingly, this makes the guidelines more a product of special interest groups than public interest. You can see this clearly if you look at guidelines that are drawn up by scientists from other organizations that aren’t the targets of such intensive lobbying. Although they’re still based in conventional dietary wisdom, they definitely look a little different. The Harvard Healthy Eating Plate is one example: for one thing, it doesn’t leave out an entire macronutrient, and the “dairy” group is gone altogether. And the first version of the USDA food pyramid may have been much more similar to the Harvard plate than MyPlate, until the food lobbies got hold of it. It’s tempting to dismiss these problems as signs of a system gone wrong: the USDA has been corrupted by lobbyists and now distributes dietary guidelines that support corporate profits, not public health. But in fact, it’s not the system gone wrong. This is how the system works. This is how it’s supposed to work. The USDA’s mission is to promote and support American agriculture, which it has to do by making sure Americans keep eating agricultural products. The “balanced diet” including an enormous amount of grains and dairy is just a sign that the USDA is doing its job well. This control of the Dietary Guidelines by people whose job it is to make American agriculture profitable results in the “balanced diet” idea. Clearly, its origins are suspect at best. But what are the specific problems with it? First of all, the “balanced diet” is flawed because of what it tries to include: everything! The idea seems to be that the best diet is the one that includes the broadest possible range foods from the “healthy” food groups, excluding “unhealthy” foods like fat and salt. There’s a blanket assumption that all food groups are healthy for all people, and even in the same amounts and ratios. This is silly. 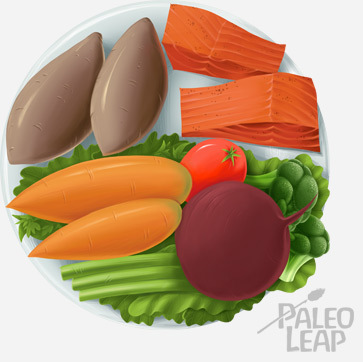 Even if you made up a “Paleo Plate” with only healthy food choices, it still wouldn’t be appropriate to recommend that everyone eat a certain amount of starch, or a certain amount of fruit. Variety for the sake of variety is not a useful nutritional goal, and it just makes the diet more complicated than necessary. Some people just feel better and healthier getting more of their nutrition from one source or the other, and there’s nothing wrong with that. For other people, an “imbalanced” diet might even be the healthiest way to correct another imbalance in their health. For example, a diabetic might find a low-carb diet the simplest and most practical way to control his blood sugar – the imbalanced diet is correcting his imbalanced health. It’s like leaning to the right if someone is constantly pushing you to the left: the imbalances cancel each other out, and the result is stability. The USDA’s answer to this would probably be that eating from all the food groups is important for getting enough micronutrients in the diet. But even the most cursory attempt to plug some food values into a nutrition calculator will show that there are plenty of ways to eat enough nutrients without needing to eat every single food group on the plate. The admonishment to eat from every food group is a product of marketing and lobbying efforts, not nutritional science. “Balancing” Your Way Into Disordered Eating? If there is still food on your plate or on the table [when you’re no longer hungry], put it away (or throw it out). Repeat the phrase “a moment on the lips, a year on the hips” as you do this. If that catchphrase doesn’t sound familiar, it’s probably because you haven’t spent much time lately reading thinspiration blogs run by 16-year-old “pro-anorexia” enthusiasts. In general, the entire website is heavily focused on finding ways to restrict your calorie intake. There are plenty of tips for “listening to your body,” but they only count if your body is telling you the “right” thing (to stop eating). If you’re getting the “wrong” message (keep eating), you’re supposed to start using smaller plates and cups, measuring all your serving dishes, and pre-portioning your meals. For Americans who already have an eating disorder (at last count, some 24 million of us), the constant focus on limiting calories and portion sizes and the blanket assumption that everyone eats too much could help validate an obsession with counting and tracking food, rather than paying attention to internal cues about hunger, fullness, and satiety. Even people without eating disorders can find the USDA guidelines bad for their mental health. Joe Satran, a writer for the Huffington Post, conducted a MyPlate Experiment last month, doing his best to live in accordance with the USDA’s guidelines for a week. He concluded that it made him “neurotic and anxious about food” but “didn’t make me feel good,” and noted correctly that humans just aren’t designed to need every single calorie planned out for us in advance. Proponents of the USDA might argue that it’s designed to be a template, an easy-to-use set of guidelines instead of a rigid rule. After all, the “plate” was supposed to be easier to use than the old pyramid model. But as Joe Satran found out, to stay within the guidelines you have to think about them all day, constantly planning meals with them in mind. He especially had trouble eating “enough” grains and dairy: by the end of the week, he’d all but given up trying to meet his dairy requirement because it was just too difficult. In other words, the restrictions and the nit-picky requirements are part and parcel of the “balanced diet.” Since you’re supposed to eat a huge variety of foods from all different groups, but still stay under a set calorie limit, the diet takes a lot of planning and measuring to actually make it work. It’s easy to see how this kind of nearly obsessive focus on food could make an eating disorder worse, or help set the stage for a new one. Another problem with the “balanced diet” concept is that the focus on “balancing” calories with exercise gives processed food companies a way to pretend that their products can be an everyday part of a healthy lifestyle. If it’s only calories that matter, then a 200-calorie cookie is just as acceptable for an afternoon snack as a 200-calorie can of sardines. The Hershey corporation even has an entire website dedicated to this idea: The Moderation Nation starts off its feature on “Balanced Eating” with “Balanced eating is not about depriving yourself of the foods you love.” and has an entire page dedicated to arguing why “portion-controlled treats are an important part of balanced eating.” Coke’s latest anti-obesity PR stunt also makes a big deal out of “calorie imbalance,” implying that a daily can of Coke is an acceptable part of a healthy diet as long as you cancel it out with enough exercise. Pepsi isn’t much better: in response to Michelle Obama’s increased focus on childhood obesity, PepsiCo created the Healthy Weight Commitment Foundation (HWCF) to “help people, especially children, achieve a healthy weight by balancing the calories they consume with the calories they burn.” The press release boasted about Pepsi’s reduction of calories in Frito-Lay chips and production of 100-calorie packs for portion control. General Mills, best known for its line of sugary breakfast cereals, has also jumped on the “balance” train: the company’s Champions for Healthy Kids program rewards programs that “help youths adopt a physically active lifestyle that includes a balanced diet.” Mars, Inc. (the company behind candy bars like Snickers and Twix) has an entire website dedicated to “healthy living,” which advises consumers to make “small ‘balancing’ changes” and eat a “healthy, balanced diet,” and brags about the company’s commitment to helping people reduce their portion sizes. The list of corporations self-righteously making commitments to “balanced” diets could go on for another 10 pages, but you get the point. The idea of “balance” gives junk food companies a sneaky way to market themselves as part of a healthy and active lifestyle. It lets them criticize a commitment to good health as being “extreme” or even “imbalanced,” as though there were anything imbalanced about not eating cheap industrial chocolate every day! What’s worse, this focus on balance is completely insincere. If people could actually control their servings of treats the way these websites claim, corporate profits would take a sharp nosedive. Obviously, the goal is not to actually help people eat healthy food; it’s to trick you into eating more junk. The threadbare screen of “balance” lets companies aggressively advertise and sell foods that are deliberately designed to be addictive and hyperstimulating, and then blame consumers for gaining weight because they didn’t “balance” them well enough. Weight loss or maintenance is the primary goal of a healthy diet. You can only achieve weight loss or maintenance by reducing calories. To accomplish this, eat a “balanced diet:” carefully portion-controlled servings of all 5 different food groups. You need something from every food group to be healthy, but you must make sure that your energy intake is less than your output. Listen to your body, but only when it tells you to stop eating. The best way to summarize the problems with this is to compare balancing your diet to balancing your body. Try an experiment: stand up perfectly stiff, like a soldier at attention, and look straight ahead. It won’t be long before your body starts to fall to one side or the other. Fortunately, most of us have a finely tuned internal balance system that lets us know exactly which muscles to fire when in response to falling forwards, backwards, or to either side. Your calves and feet automatically correct for you. Even if someone pushes you, your body will reflexively “catch” itself by taking a step or leaning into it. This happens thousands of times a day. 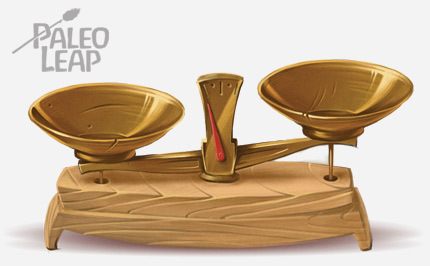 When you stand this way, you’re balancing yourself using your own internal calibration. This is like eating in accordance with your body’s real hunger. If you put two people in a room and have them do this, they’ll both need to re-balance themselves in different ways, just like two different people will both need to eat in different ways. Appetite and posture regulation both depend on very complicated systems, but in both cases, the system is regulated internally so well that you don’t need a special set of “MyPosture” guidelines to tell you how to do it. No imagine that that you’ve been petrified into a perfectly stiff human-shaped block of stone. You can no longer adjust your own posture. Instead, you have a friend circling around you with a schedule of carefully calibrated “balanced posture” adjustments that a government committee has determined most nearly approximate the adjustments needed by an average person. The friend’s job is to push you back into place whenever you start to fall. What’s more, the friend has to push you the same amount of times to the left, right, front, and back, regardless of which direction you’re falling (because remember, you have to eat all the food groups!) And your friend is constantly trying to push you with the same amount of strength, preferably as little as possible (eating the same amount of calories every day) regardless of how fast you’re actually falling. Suddenly, the process of keeping your face off the floor becomes awkward and clumsy, determined completely by outside regulations without regard for what’s going on with your body in real life. Chances are, you’ll fall down in 5 minutes at most. This is like trying to regulate your diet according to USDA guidelines: it’s one-size-fits-all, it takes up enormous amounts of time and energy, and in the end, it doesn’t work: strict calorie-counting and starvation is not an effective way to lose weight. The point of this comparison is that true balance has to come from within, not from without. The “balanced diet” of the MyPlate guidelines is externally imposed; it’s always going to be unstable at best. The real “balanced diet” is the one that fills your body’s needs – and you can only learn that from your body itself, not from the USDA and definitely not from the dairy or meat lobbies. Clearly, the USDA’s conception of a “balanced diet” is fatally flawed even without getting into the specific foods that are recommended or discouraged. The insistence on eating from all the food groups is unnecessary and ignores the incredible diversity of human body types and needs. The focus on weighing and measuring that teaches people to trust calorie counters instead of their own bodies, and the idea of “balancing” food with exercise lets junk food companies market their products as a normal part of a healthy diet. This is a perfect recipe not for curing obesity, but perpetuating it. Real dietary balance doesn’t come from forcing your body into pre-portioned guidelines. It comes from paying attention to your food and your body, noticing which foods make you feel good and which foods don’t, and then eating in accordance with what your body needs. This is incredibly hard for a lot of people, because most of us have lost touch with our true sense of internal balance. We’re used to seeing our hunger as something to fight, not something to honor. After years of artificial laboratory “foods” designed to drown out our body’s natural signals, we might be struggling to hear those signals at all. If you’re struggling with these issues, Intuitive Eating might be a useful resource – the approach isn’t perfectly Paleo, but the basic principle (learning to listen to your body) is sound. Unfortunately, learning to recognize and listen to those signals is the only way to eat a truly “balanced diet.” After all, the point isn’t to eat a certain amount of foods from different food groups for its own sake, or to mathematically balance energy in and energy out to have pretty numbers in a calorie tracker. The real goal is to meet your body’s needs for nutrients and energy, whatever those needs are. A diet that fills those needs is the real “balanced diet,” and only your own body can tell you what that is.